CEDAR FALLS – Irma Belle Duncan, 96, of Cedar Falls, died Thursday, Feb. 7, at Good Samaritan Society-Forest City. She was born Feb. 3, 1923, in Dundee, daughter of Charles and Marie (Dillon) Otterbeck. She married Albert Duncan Jr. on March 6, 1943, in Bethany, Mo. He preceded her in death on Nov. 11, 1995. She graduated from Volga High School, was a homemaker, and worked in retail sales at Slumberland in Cedar Falls. 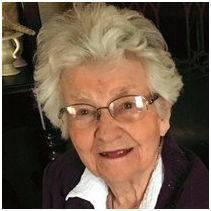 She was a member of St. Patrick Catholic Church for 65 years. Survived by: three children, Nancy (Jack) Anderson of New Hampton, Michael (Tina) Duncan of Cedar Falls and Debi (Kim) Smith of Polk City; three grandchildren, Michelle (Kevin) Bunger of Forest City, Jason (Karissa) Miller of Bradenton, Fla., and Sean Smith of Des Moines; four great-grandchildren, Kailey (Logan) DeVries of Urbandale, Nicholas Bunger of West Des Moines and Hannah and Zoey Miller of Bradenton; a great-great-grandson, Elliott DeVries; a brother, Charles (Becky) Otterbeck of Bonita Springs, Fla.; a stepgranddaughter, Natalie Howe of Kansas City, Mo. ; and three stepgreat-granddaughters, Tabitha, Zoey and Mia Ruff, all of Kansas City, Mo. Preceded in death by: three sisters, Gertrude McMillan, Genevieve Weber and Irene Fliehler; and a grandson, George Michael Duncan, in infancy. Services: 1 p.m. Friday, Feb. 15, at Richardson Funeral Service, Cedar Falls, with burial in Mount Olivet Cemetery, Waterloo. Visitation will be for one hour before services at the funeral home.